I've long been a fan of Georgia O'Keeffe's powerful abstract images of flowers, rocks, shells, animal bones and landscapes. Her contoured forms and subtle tonal transitions have left me mesmerized time and again. 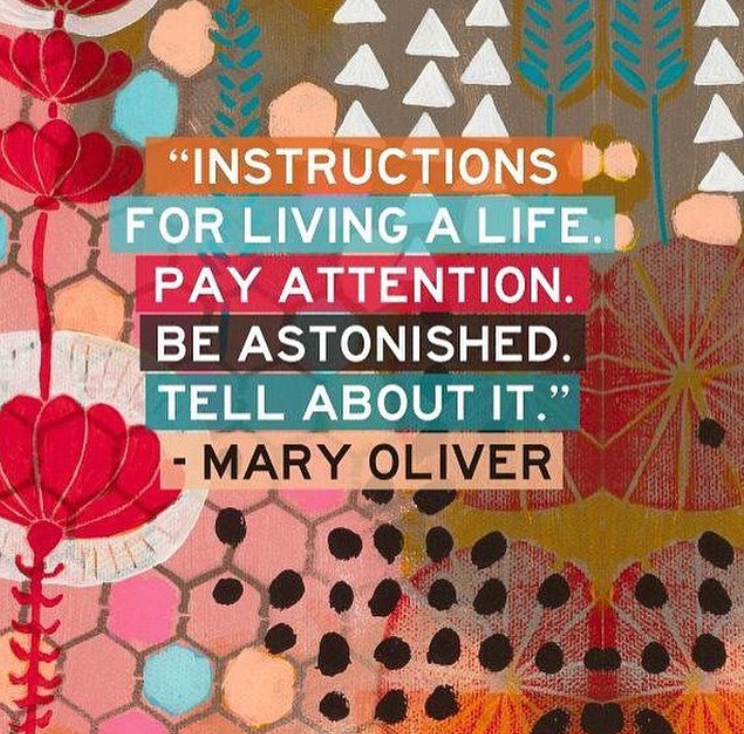 I've also long known that before she lived and painted in the same New Mexico high desert I once called home - she was first inspired by the supremely stunning landscape of Palo Duro Canyon in the Texas Panhandle. 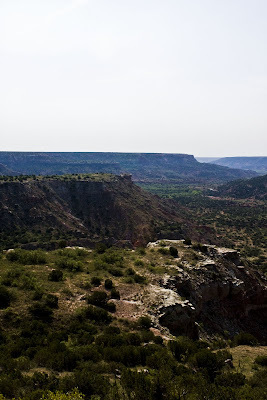 Palo Duro Canyon has been on my bucket list for a couple of decades and was the first order of business for the road trip. At mile 281, I arrived very early on Day 2 and waited for the sun to rise and the gates to open. I was not entirely prepared for how absolutely beautiful the landscape would be. Or for how fantastically empty the park would be. I am quickly learning that the few weeks between "Back to School" and Labor Day Weekend are an incredible window of opportunity to enjoy some of America's most amazing places in absolute solitude. I explored for hours without passing a car or seeing another human. 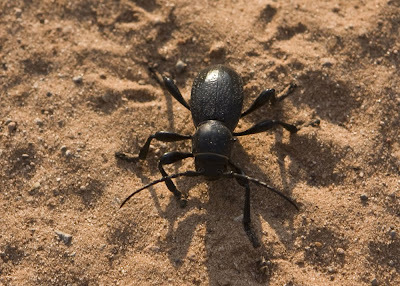 This Cactus Longhorn Beetle was navigating the sandy desert floor along the Prairie Dog Town fork of the Red River - likely looking for a prickly pear cactus patch to play host for breakfast or for egg laying. Many thanks to everyone's favorite bug scientist - the brilliant Doug Taron at Gossamer Tapestry Blog for the positive beetle ID. I started at dung beetle and settled on giant tiger before Doug saved the day. 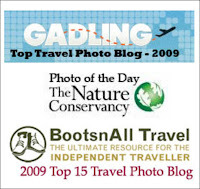 His blog is a must-read and his love for beetles, bugs and butterflies is infectious. This large ant with a velvet looking abdomen is surprisingly called: Velvet Ant. In actuality it is a large wasp - the females, pictured above, being wingless. 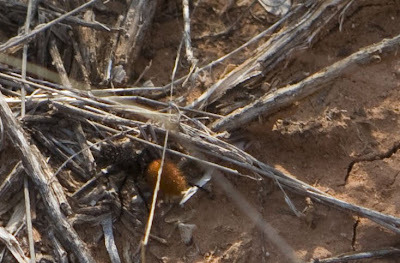 Velvet Ants are often called Cow Killer for the painful power of their sting - rating a 3 out of possible 4 on the Schmidt Sting Pain Index. The aposematic coloring was enough to force my distance until Doug the bug man could weigh in again. There's also a great post on the velvet ant here at the Firefly Forest. 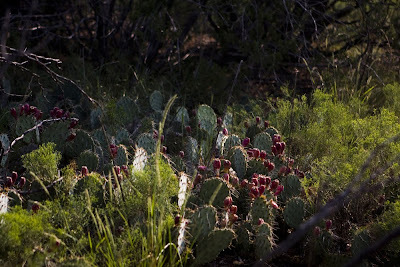 The natural vegetation of the canyon includes sage, yucca, juniper, prickly pear cactus, mesquite, and cottonwood. 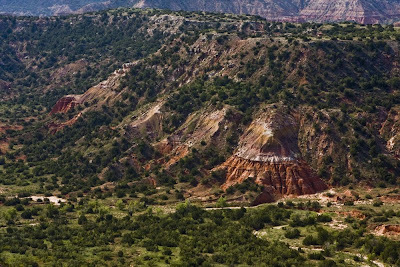 120 miles long, 20 miles wide, and 1200 feet deep, Palo Duro Canyon is the second largest canyon in the USA after the Grand Canyon. The erosion resistant sandstone, claystone, mudstone and caprock limestone, layering in resplendent shades of red, orange, yellow, white and purple, represents four major geological time periods over 240 million years. 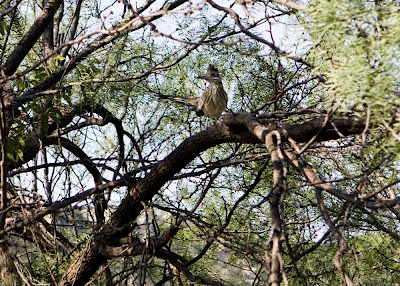 "Because of the availability of wood, water, game, edible wild plants, raw materials for weapons and tools, and shelter from harsh winter winds, Palo Duro Canyon was a favorite camp site for both prehistoric peoples and later Indian tribes. The first known inhabitants, who date from the period between 10,000 and 5,000 B.C. were big-game hunters of now-extinct giant bison and mammoths. 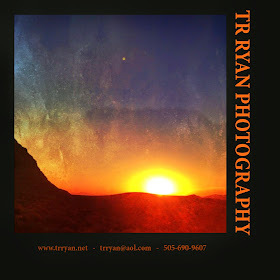 Archeologists have found projectile points, stone tools, mortar holes, paintings, carvings, and other artifacts of these and later prehistoric people at numerous sites throughout the canyon. " The first European explorers to discover the canyon were members of the Coronado expedition , who visited the canyon in 1541. 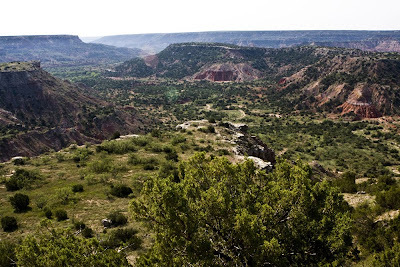 Buffalo-hunting Apache Indians lived in Palo Duro at the time, but were later displaced by Comanche and Kiowa tribes, who had the advantage of owning horses brought over by the Spanish. The canyon matches its breathtaking beauty with a heartbreaking legacy. In 1874 the US military captured and killed over a thousand Comanche and Kiowa horses forcing the devastated and demoralized tribes to concede their land and face removal to Oklahoma. 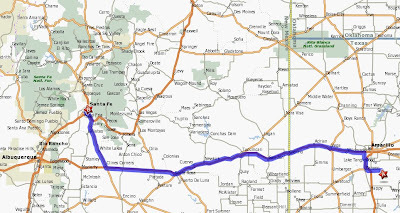 The next stop on Day 2, at Mile 429, was Tucumcari, New Mexico. 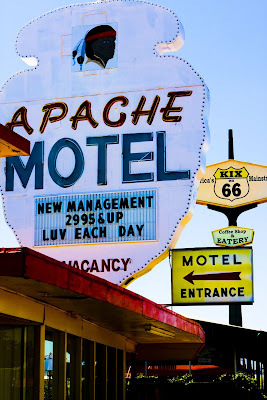 Tucumcari was the quintessential Route 66 stop. And, more-so than any other town on the route, much of that legacy remains in the preservation of motor lodges and restaurants. 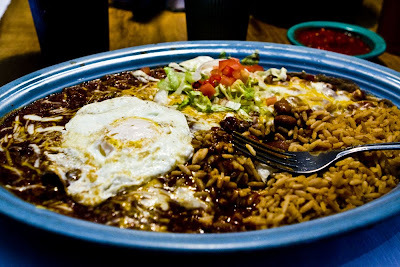 and savored an outrageously delicious red chile pork enchilada complete with fried egg on top. Yum! 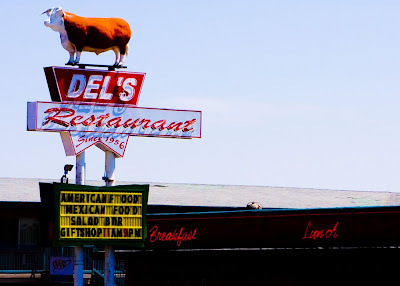 The historic motels and restaurants might still remain - but the future of Tucumcari is becoming abundantly clear. At Mile 543 I said goodbye to I-40 and the old Route 66 and made the turn at Cline's Corners toward Santa Fe. 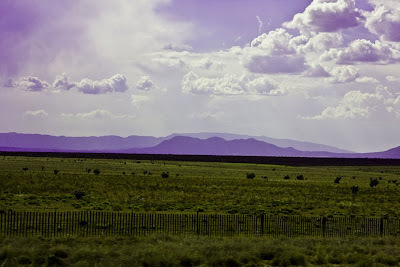 The haze from the LA fires mixed with northern New Mexico's famous afternoon monsoon rains made for a breathtaking drive that skirted the foothills of the Sangre de Cristo Mountains in San Miguel County. 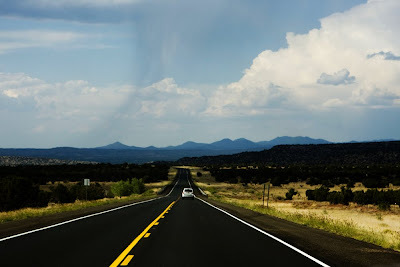 Finally, at Mile 596, I arrive to Santa Fe, my home for thirteen years. 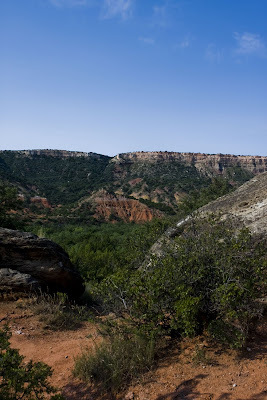 Palo Duro is on my bucket list also. I've been in Amarillo a bunch on business but always with somebody. 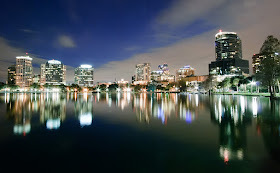 One of these days I'll go there. Don't put it off Yogi! I did for 15 years and I wish I hadn't. 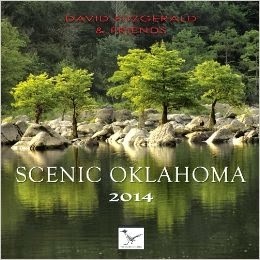 Its only 4.5 hours from OKC but a world away. The camping sites are excellent. I'm sure you can detect me blushing right through the intertubes. Thanks for the kind words. Palo Duro just went onto my bucket list. How can I have never heard of this place before? 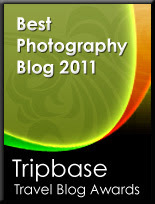 Most excellent photos- but I wouldn't expect anything less from you. 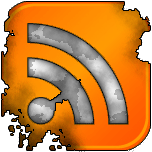 Something weird is up with your blog. Can't see any pictures, you are no longer following me, & blogger says your blog has been removed. What's up with that ??? 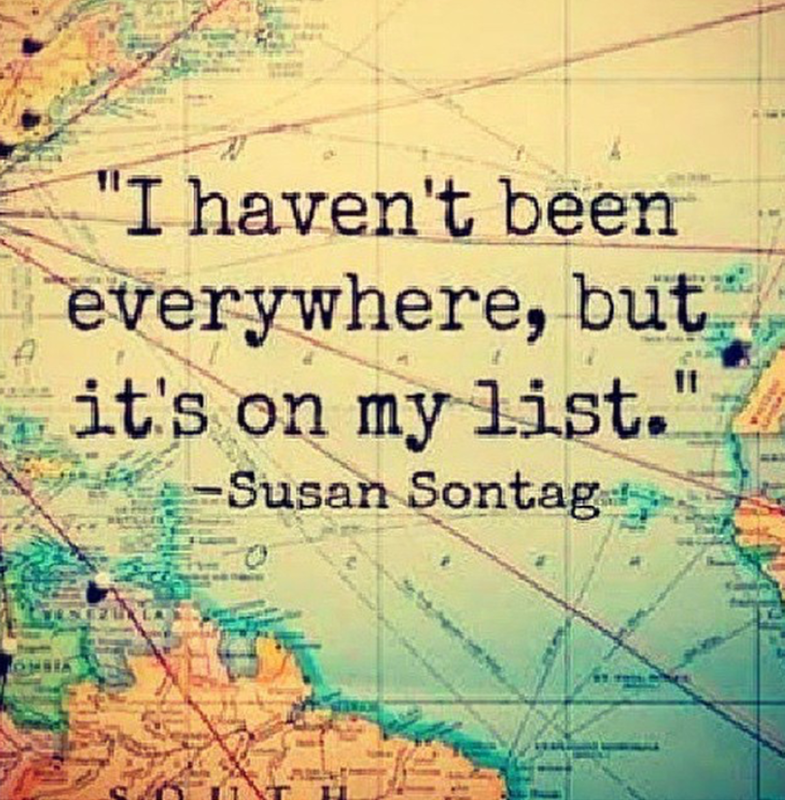 Love the commentary on your trip though. Safe travels. BTW Georgia O'Keefe is one of my favorite artists. The canyon is beyond beautiful. You wandered for hours alone? Alone can be scary, Tim. And thanks for the heads up on Velvet Ants! Love the fried egg on top. Yummmmm! I've been through TX how many times and never saw this???? I love looking through your eyes, Tim. TR, you are making me think of that song, "On the road again.... just can't wait to get on the road again..." What a great time you are having. 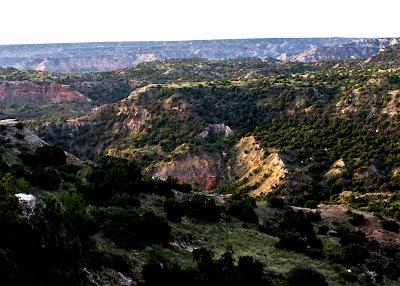 I have never heard of Palo Duro Canyon until now. Now I have a new place I want to see, but first I have to make it to the Grand Canyon! 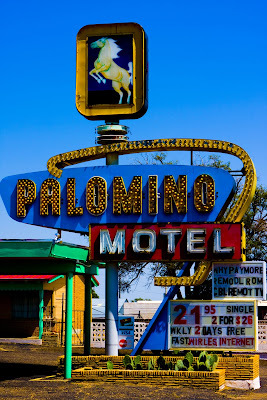 i love these signs - i'll stay at the palamino motel as long as that bug isn't there. 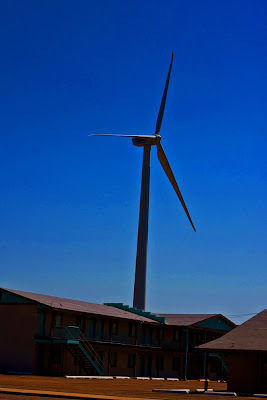 Seeing your blog makes me want to make another trip out to see Palo Duro! 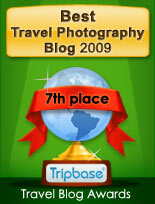 I was very rushed the last time I went to the park and would love to go camping down there next time. Great pictures, by the way! 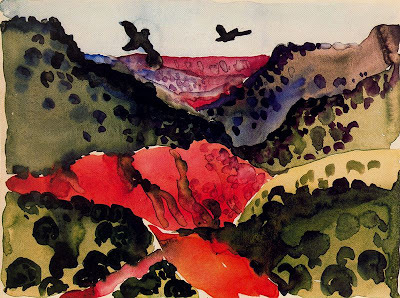 That painting by O'Keeffe shouts the beauty of that Nature.